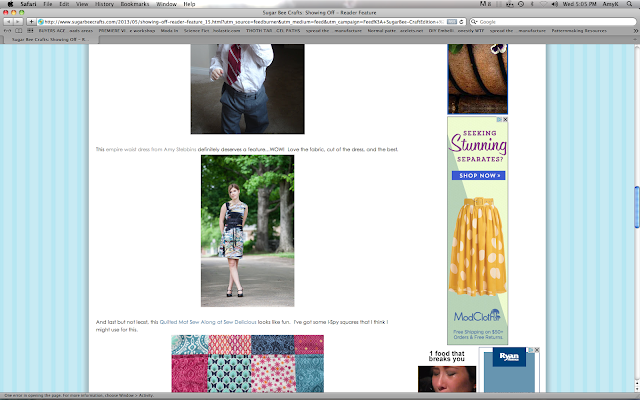 I just wanted to say thank you to Mandy for featuring my Empire Waist Dress on her blog Sugar Bee Crafts. Ciarra wearing the Empire waist dress I made. Featured on Sugar Bee crafts blog. Thanks again Mandy!! 🙂 Check out her blog by clicking HERE. It is WARM here today! I just came back home from visiting the local farm stand near my home called “The Farmer’s Daughter”. We bought a melon, some lovely tomatoes, plums, local strawberries, cukes, and some gorgeous potatoes for the beef stew I am going to make. I just love summer! The produce, the boating, the fun! I LOVE IT!